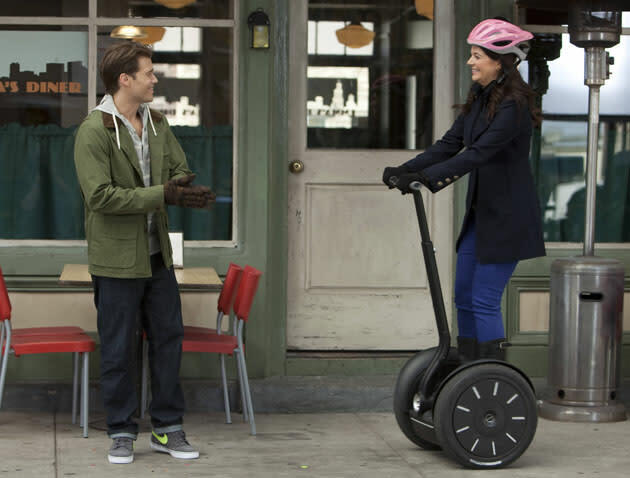 Romance is in the air on “Happy Endings”… and we don’t mean Alex and a rack of spare ribs. The notoriously unlucky-in-love Penny gets a new love interest this week, played by Nick Zano (“2 Broke Girls,” “90210”), and we’ve got an exclusive first look at the lovebirds’ wobbly first date right here. Plus, we got a chance to chat with Zano last week, and he told us all about his new “Endings” role and how he fits in with one of TV’s funniest ensembles. Of course, this is Penny we’re talking about here, so her first date with Pete (Zano) gets weird, quickly: She’s embarrassed that she has to wear a prescription helmet after a concussion, so she tries to hide her ailment by suggesting a Segway tour -- with mandatory headgear, of course. Problem is, she has no idea how to drive one of those things. Pity the poor chairs and garbage bags that get in her way. And we’re sorry to break it to you, ladies, but Zano, who’s notorious for taking off his shirt in past roles, is keeping his clothes on this time around. He says he’s happy to be able to skip the gym for once: “Now I can just let myself go… I’m trying to bulk up right now.” He also just shot an upcoming episode of “2 Broke Girls” a few weeks ago (“Johnny comes back to the diner,” he teases), but for now, let’s just enjoy him as Penny’s man of the moment. Maybe 2013 will turn out to be the Year of Penny, after all. “Happy Endings” airs Tuesdays at 9 PM on ABC.